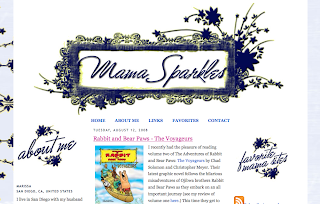 Today's blog critique is for Mama Sparkles. I've been blogging a little over six months and I'm wondering what people think about my content and my blog in general. I find that not very many people leave comments (unless I'm having a contest.) Also, I find that I don't have a lot of returning visitors - many people will visit my blog once and not return again. What can I do to encourage people to return to my blog and to leave comments? Readers, what do you think of Marissa's content and her blog? What could she do to attract more comments?